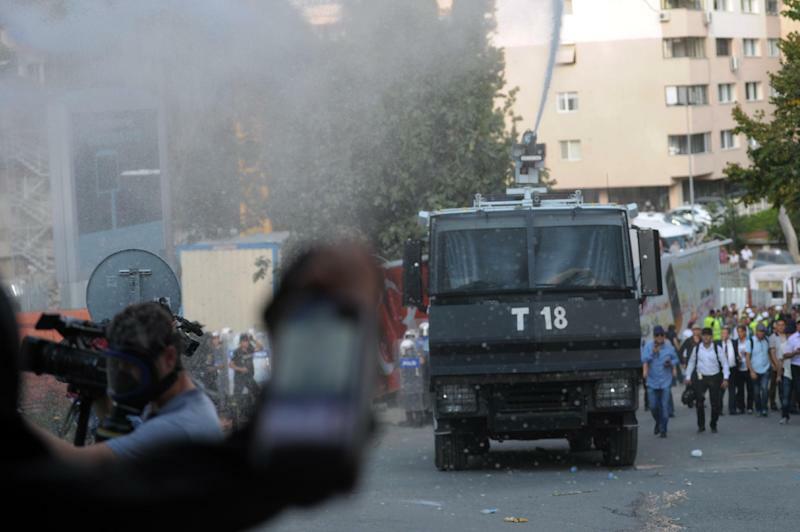 Istanbul (AFP) - Turkish riot police on Sunday fired tear gas and water cannon at protesters in Istanbul, a day after 10 workers were killed when a lift crashed to the ground from the 32nd storey of a building. Police stepped in when more than 1,000 people gathered near the construction site in Istanbul's upscale Mecidiyekoy district to express their anger at Turkey's lax workplace safety measures, an AFP photographer at the scene reported. "This is not an accident, this is not a destiny, this is murder!" the crowd shouted, at the first major confrontation between demonstrators and the authorities since Recep Tayyip Erdogan was inaugurated as president last month. Authorities said an investigation had been launched into the incident at the Torunlar Centre, which is being built on the former site of Galatasaray football club's Ali Sami Yen stadium. The exact cause of the accident remains unclear. There have been claims that the elevator broke down two weeks ago and that workers were awaiting funds to repair it. "I lost my two sons," said father-of-six Mithat Kara, as he sat in tears at the side of the construction site. Among the dead was also 21-year old student Hidir Ali Genc, who used to work at construction sites to fund his university expenses. The incident created a storm on social media, with users criticising the government's handling of the protest. "State, answer to industrial accidents. Workers respond by making barricades," one Twitter user wrote. Engineers were inspecting the site on Sunday. Thirty-six of the tower's 42 floors have already been completed, local media reported. Police on Sunday released eight people detained in connection with the incident, including the safety director of the site, after hearing their testimonies. Labour and Social Security Minister Faruk Celik said the accident happened after a freight elevator used to carry construction materials slipped off its rails, with workers and building materials crashing to the ground. "We will go after (the guilty people) if there is any negligence or shortcoming," he was quoted as saying by Turkish media. But the opposition ratcheted up pressure on the government, pledging to improve work safety conditions. "Work accidents have turned into work murders," said Kemal Kilicdaroglu, leader of the main opposition Republican People's Party (CHP). "The CHP will settle account at every platform. We will take initiative so that inspections will not be merely on paper." The building's owner Aziz Torun denied any responsibility, as well as the possibility of a technical problem with the elevator. "Authorities and the prosecutor will decide" what caused the accident, he told a press conference. Prime Minister Ahmet Davutoglu called the workers' deaths "very painful and very saddening". "The investigation will be carried out in detail," he told reporters on Sunday. The incident, which is due to top the agenda of the weekly cabinet meeting on Monday, has put Turkey's poor record on workplace safety under further scrutiny. In May, 301 miners died in the western town of Soma in Turkey's worst-ever industrial accident. Most of the dead were killed by carbon monoxide poisoning. Turkey has the world's third-highest rate of deadly workplace accidents, according to the International Labour Organisation.